DES MOINES, Iowa —Some local Vietnam War veterans want lawmakers to help people exposed to Agent Orange, a carcinogenic herbicide used during the war. The herbicide is now linked to 14 diseases, including prostate cancer and Parkinson's disease. The diseases can be passed on to veteran's children through their DNA. Veterans and their family members shared their stories at a symposium Saturday in Des Moines. Jill Monson of Clear Lake said she needs a cane to walk. She's only 44 years old, but doctors told her that her bones have a different age. "About a 100 (years old). I lost about 60 to 70 years of bone in two years," Monson said. Severe osteoporosis, cancer, seizures and a heart attack are among the complications she has faced. Monson said it's all linked to her father's exposure to Agent Orange during the war. "I always thought I was a very unhealthy person and really never knew why," Monson said. "It seems the more I'm reading, the more connections I'm finding with my problems and I'm seeing my daughter's problems as connections." There are two bills in Congress, HR1769 and S901, aimed at helping affected veterans and their families. 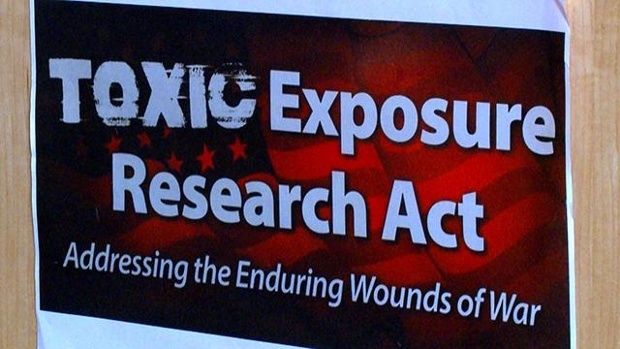 The Senate bill is known as the Toxic Exposure Research Act. "We have some issues that need to be dealt with, not just the research and finding cures, but the funding so we can compensate those that have been seriously affected," said Dan Gannon, commissioner of the Iowa Commission of Veterans Affairs. About 300 people signed a petition for Sen. Joni Ernst to sign S901. Organizers said Sen. Chuck Grassley and all the other congressmen have already signed. Monson said the issue is a fight for her family's future. "As a mom, like I do each and every day I fight for justice for (my daughter) and I will continue as a mom, just like I'm here with my dad,” she said.